WAUKEGAN, Ill. (WLS) -- A man wearing a medical mask robbed a bank in north suburban Deerfield. The FBI said he hit a TFC bank, located at 16 South Waukegan Road, around 12:45 p.m. Wednesday. The suspect is described as a 30-year-old African American man who is about 6 feet tall and weighs more than 200 pounds. 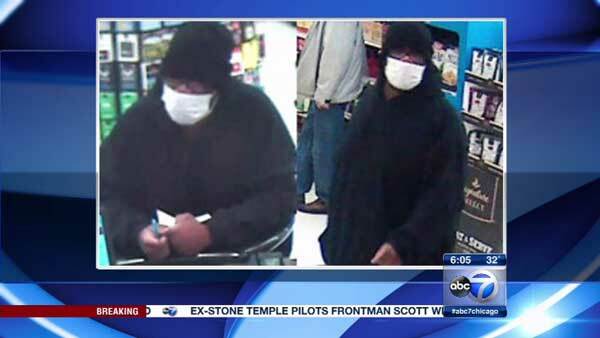 He was wearing a black hooded sweatshirt, a black knit hat, glasses and a medical mask that covered half of his face. Investigators think the same man robbed a bank in Waukegan, located at 922 Green Bay Road, around 6:50 p.m. on Nov. 12. In that incident, he was wearing a breathing mask and implied he had a gun. Waukegan police did not disclose how much money was taken. Anyone with information regarding the suspect or these bank robberies should call the FBI at (312) 421-6700. Police are looking for the man who robbed a bank in north suburban Waukegan while wearing a breathing mask.